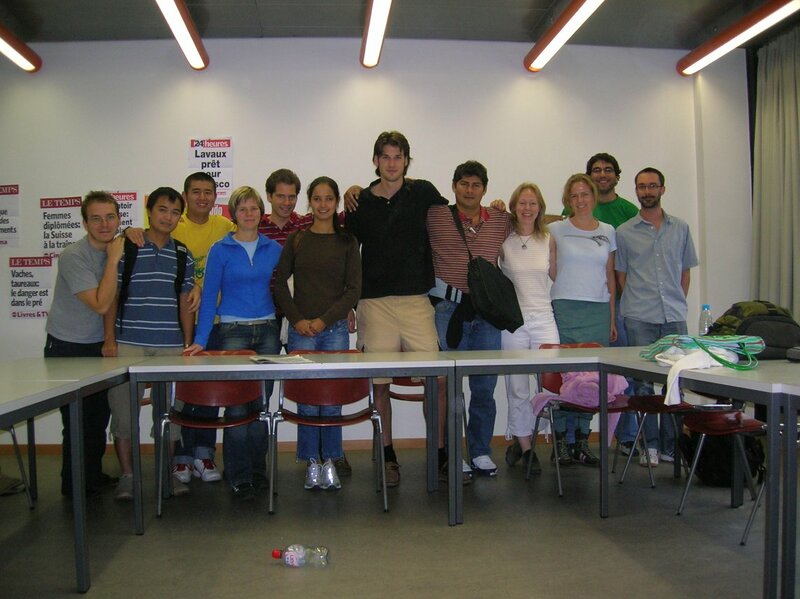 It was a 3-week intensive course, meeting every day from 8-12 . This did wonders for our speaking ability, well beyond what I expected. It is helpful to have this continuous verbal practice as well as to have someone sit there and call you out on your common mistakes. I wish I could have substituted the last 3 months of my high-school French classes for a single 3-week course like this one. The hours would work out to about the same, so it should be feasible for a flexible school. As an aside, can you imagine how to make this happen in a (public) grade school? Grade schools seem extremely tied into 1-hour periods and year-long classes. A class less than a quarter must be shocking already, and the thought of changing the revolving cycle of 1-hour classes must surely be incomprehensible to the powers that be. And what about enthusiasm? Everyone in this class really wanted to speak French, not just get a mark on their report card. In a public school, is it politically possible to separate students out like that? I would be delighted to be proven wrong, of course, but from what little I know of public schools, this is something you'll have to see in private schools and in higher ed. Anyway, the class was also excellent for getting in touch with some of the other foreigners. The folks pictured above come from Germany, Sweden, the Czech Republic, New Zealand (emphatically not aww-straylia!! ), Peru, Brazil or Portugal (not sure which), China, Vietnam, and Lebanon (two from Lebanon, in fact). Just like in Denmark, I find it much easier here to bond with fellow people from outside, no matter from where. One by one, the foreigners tend to be more bizarre than the locals. However, we share something stronger: our strangeness. The locals find us incomprehensible. They think everyone is born knowing that, e.g. : stores close early on Saturday instead of later, that public transportation completely shafts you unless you get a 1/2 card, that rent and contracts always start on the first of the month.... Everyone knows that Ascension Day  is a holiday, whereas I naively grabbed that open talk slot on a day when no one was there. They also come from foreign areas, incomprehensible to computer researchers: physics (atomic fusion--yeah! ), microbiology (detecting AIDS in a sample using lasers! ), environmental science (how much CO2 does this or that reduce? ), and screw school I want to travel (we all know people who majored in this). Anyway, now it is over, and it is back to the grind. It was fun, but it will be nice to get some work done, too! [note 1] That's "8-12" in EPFL time. Even in English, the people here speak a university dialect. In universityese, "8-12" translates into "8:15-11:45 with a 30 minute break in the middle". [note 2] The day Jesus rose into heaven. It is observed early in the summer. Do not try to buy anything if you are in Switzerland. The doors will all be closed. For more, read Wikipedia's entry.